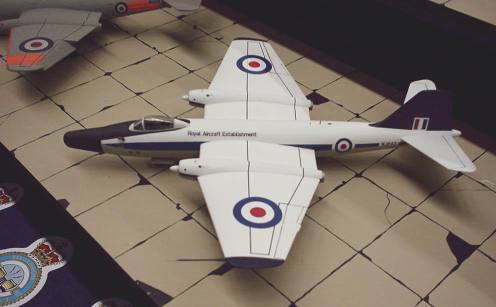 This model was made for an IPMS NL British Military Aircraft Collection SIG (formerly Canberra SIG) display to celebrate the 50iest anniversary of the Canberra's first flight. The aim of the organisers was to display as many different variants and nationalities of Canberra's as possible, so I was looking for an original subject. I found one on a picture in the book 'Testing Colours' in WJ643, a hybrid B.2/8 which had started life as a B.2 but was gradually converted into a B.8 and was fitted with a bigger nose cone. It had served its life at the Royal Aircraft Establishment at Farnborough and the picture, which I copied below, shows it in RAE's own variant of RAF Transport Command's white and gray livery. 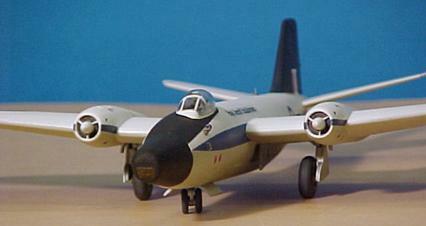 The model was based on the recent Revell rerelease of Frog's old Canberra B(I).8 kit. The plastic parts for this Revell kit come straight from Ukraine and are in bad shape: there's little left of the original Frog surface details, fit is rather poor and the plastic is very soft. However Revell added an apologetic note to the kit about (its lack of) quality and what's more an excellent set of decals. I had a firm deadline to meet, so there wasn't much time for correcting errors or going overboard on detailing. 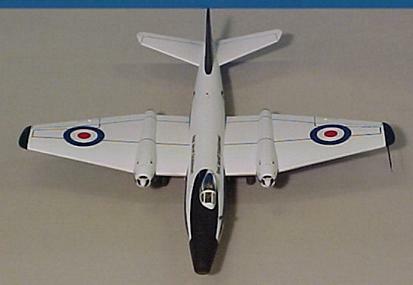 On the picture WJ643 looked just like a B.8 with a new nose cone so I carved a piece of balsa wood into the shape of the new nose cone, cut off the kit nose and decided to build the rest of the kit almost straight from the box. Starting with the cockpit interior I deviated from my plans by adding some bulkheads, consoles and details to avoid any see-through effects and by dressing up the seat to look like a proper ejection seat. 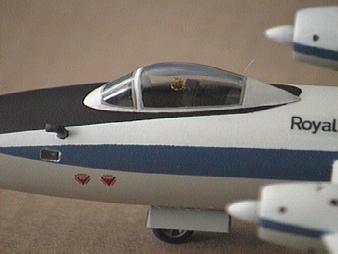 With the fuselage I started by cutting off the tip of the nose using a Roco multi-purpose mini saw. Then I joined the fuselage halves and glued a plasticcard disc over the gaping hole in the nose to serve as a base for the new nose cone later. Joining the fuselage halves I noticed the styrene cement (Model Master Liquid Cement) was actually beading on the surface, even on spots that I sanded (I did wash the parts before assembling, the beading was not caused by grease but rather by the plastic not being compatible with the styrene cement). I had no problems while using Slaters Mek Pak for adding the plasticcard bits to the cockpit area, although Mek Pak softened the plastic much more than usual. I tested all types of styrene cement I had and decided on using Mek Pak for unloaded joins and Faller Expert for fusing the fuselage halves, wings and tail planes and other load bearing joins. I left the bomb bay doors off until final assembly, this allowed me to reach inside the fuselage for adding weight to the nose and for accessing the wing attachment points. I used a cardboard jig for setting the tail planes at the proper 10' angle. There is a couple of problems with the wings, first of all the inner wing panels should be at a 2' angle and the wing panels outside of the engine pods at a 4' angle, however the angle between the inner and outer wing panels is fixed at much more than 2 degrees. 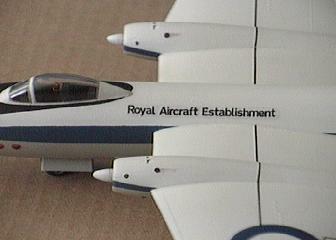 Secondly the wing attachment points are too high up the fuselage. Both of these problems would have taken too much time to fix, so I ignored 'm, although I did try to bend the outer wings down a bit. I fixed the wings at a 2' angle to the fuselage by inserting some plasticcard strips between the fuselage and the lower wing halves. The edges of the bomb bay doors needed trimming, which proved very easy because of the soft plastic. I inserted 0.8mm thick plasticcard discs between the main wheel halves. Finally the nose wheel leg proved too tall and needed to be shortened by 2mm, I reinforced all landing gear legs by drilling them through lengthwise and inserting metal pins. Added ejector handles to the seat made out of copper wire, painted yellow with black stripes. A whip aerial next to the canopy was made out of nylon filament. A cooling intake made out of sprue was added to the port side of the nose. Tiny blade antennae on the rear fuselage were made out of copper wire, squeezed flat between a pair of pliers and sanded into shape. A clear red Anti Collision beacon was made out of a blob of Kristal Kleer, painted with Tamiya X-27 Clear Red. A long pitot tube on the port wing tip was made out of sprue, heat-stretched around a core of 0.5mm steel rod, the steel rod was firmly mounted in the wing tip. Added starter exhaust and venting holes to the surface of the engine pods, making shallow holes using a motor tool fitted with a flat miniature cutter head. Filled and scribed the poorly defined aileron contours in the upper wing halves. Using a sharp needle, the entry hatch was scribed on the starboard side of the nose, as were some smaller hatches. For painting I picked Pactra Acrylics, because the colours are accurate and the model can be handled again within half an hour after painting it. First I sprayed the top half white, then I masked the edges and sprayed the lower half gray. Upon removing the masking it became clear that it wasn't just adhesive that wasn't sticking to this type of plastic, as some of the paint lifted as well. Fortunately this paint can be touched up without leaving a trace, but I knew I was in trouble because the cheatlines would take a lot more masking. I decided to use Tamiya Masking tape for the remainder of the masking jobs because it was the lowest-tack tape I had. Sofar I had only used the Tamiya tape for straight lines and while masking the Canberra cheatlines I found that it took a lot of effort to get this tape to conform to curves and adhere to the surface at the same time. First I masked the tail section, leaving a white cut-out for the fin flash, and the wing tips and sprayed those Royal Blue. Then I mixed Roundel Blue for the cheatlines by adding some white and red to the Royal Blue paint I had left until it matched the blue for the roundels. I measured the size of the fuselage roundels and guestimated the size of the serial numbers and cut little tape masks for these. I masked the cheat lines section by section (nose to wing, wing to roundel, roundel to serial, serial to tail tip) and sprayed each section separately, this reduced the complexity of masking the model and avoiding overspray vastly. I decided to paint the cheatlines on the engine pods by hand, because the intakes were too complex to mask without using some messy masking fluid (which would probably have removed most of the white and gray paint !). The engine pods held another nasty surprise in that I had to aim my airbrush at an angle for spraying the nose part of the cheatlines, thereby spraying 'under' the masking tape edges. This went fine on the starboard side, but on the port side the tape lifted a bit, resulting in a jagged edge that I had to clean up. I used Mecanorma PS-8 dry-decal lines to apply the black walkway lines. For the decals I used the roundels that came with the kit. These are very nice and thin but unfortunately rather translucent, making gray paint and black walkways show through clearly. I tried to fix this by applying some white acrylic paint under the wing decal that I just applied, which helped a bit. For the other roundels, I painted out the black walkway line and painted white patches over the gray on the fuselage sides. Apart from some service markings I needed to find the 'RAE' markings and serials elsewhere and what better to look for than ModelDecal sheets. I could not find any properly sized 'RAE' markings, so I decided to make my own by scaling down the 'RAE' markings on ModelDecal sheet 79 using an office copier. 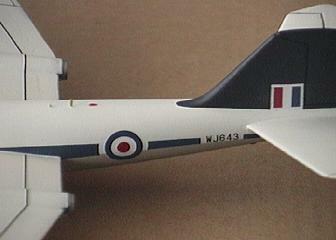 The 12in serials for the fuselage were taken from ModelDecal sheet 36. Date finished: November 7, 1999. 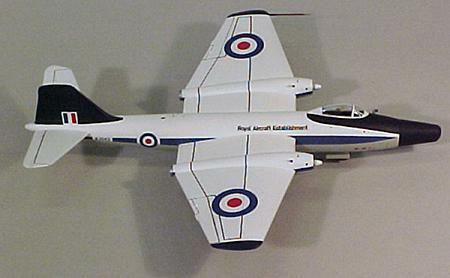 The finished model in the Canberra line up at the 2000 IPMS-NL Nationals.